The most impactful presentation I listened to at ISTE 2013 this past week was delivered by Dr. Scott Garrigan of Lehigh University. Garrigan described to us the massive impacts on Massively Open Online Courses (MOOCS) on higher education. While he devoted too little time to speculating about the ramifications for K-12, he did a masterful job describing the disruption that this will create for educational institutions. Georgia Tech is offering an online three year Masters Degree in computer science for $6,600. The California State University system in partnership with Udacity announced an initiative for piloting online courses from San Jose State for $150 a piece in courses like remedial algebra course, college-level algebra and introduction to statistics. These will be offered through community colleges and high schools with the aim of proliferating throughout the state (and no doubt, beyond). Certainly there are drawbacks to online courses, not the least being the “caring” touch, and accountability provided by face-to-face learning. Obviously the thousands of persons taking these classes are drawn to the ability to take them at one’s own pace on one’s own “class meeting” schedule. Regardless, the incredible cost differential almost makes these arguments moot. The university system is facing a massive shakedown as a consequence. It is clear that the traditional brick and mortar university as we have know it will change soon, and some may face extinction altogether. 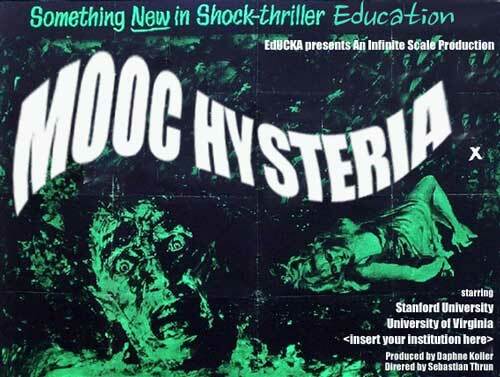 Unfortunately, though titled, “How Will the MOOC Explosion Affect K-12 Schools and Students”, not much time was spent speculating on the affect on K-12. I have been reflecting on this since and have the following meagre thoughts. It is obvious that ubiquitous online course offerings from some of the top professors in the nation will have an effect on K-12 schooling that goes far beyond the home schooling front. I have the strong impression that the powerful pressures on traditional high schools to accept these courses in place of requirements or for advanced placement will come before enlightened policies are in place to deal with these demands. Accreditation is a huge issue. Even if schools and school districts welcome (or are mandated to) accept online courses across disciplines it certainly will be difficult to sort out what kind of courses are acceptable. Perhaps this will occur at the state level. Michigan’s our current governor, Rick Snyder is a keen proponent of online courses as part of his Anytime, Anywhere” education reform plan, believing that school funding should follow students who seek options other than their neighborhood school. Of course MOOCS challenge brick and mortar schools to justify themselves as providing significant value-added beyond providing content. Teachers that offer conventional lecture/test methods will find it difficult to argue that they provide an experience superior to lectures provided by the leading authorities in the world accompanied by interactive software developed an extremely sophisticated outfit like Udacity. I really appreciate how clearly and profoundly Scott presented these issues. I have more questions than answers, but hope to revisit this subject in the coming school year with my colleagues, so that we can do are best to prepare for the inevitable.